Having recently exorcised a few of my sourdough demons, I am happy as a clam baking bread every weekend. This version is an adaptation of a formula that called for 100% durum semolina flour. I took a small step back by including some regular flour in the mix, just a tad. The dough is mixed the day before baking and rises for 12 or more hours in the fridge. The semolina flour – which must absolutely be the correct type – gives the crumb a yellow hint, and takes the taste of the sourdough into a new direction. A simple bread, with delicate flavor, but a hearty crust just like expected from a rustic sourdough. Make the levain 10 hours before preparing the dough. Mix all ingredients and leave at room temperature for 10 hours. When the starter is ready, mix 350 g water with the malt and the starter (all of it). When well combined, add the semolina, and the bread flour, mix until a shaggy dough forms. Let it rest for 20 to 40 minutes. Add the salt and the remaining 50 g water. Mix well (you can use a Kitchen Aid type mixer for 2 to 3 minutes in low-speed if you prefer). Let the dough ferment at room temperature for 2 hours, folding the dough every 30 minutes. After the last folding, leave the dough undisturbed for 20 minutes. Shape the dough as a ball and place in a floured round container. Leave at room temperature for 20 minutes, then refrigerate for 16 to 20 hours. Remove the dough from the fridge 1 to 2 hours before baking in a 450F with steam for 20 minutes, then reduce the temperature to 430F and bake for 25 minutes longer, until dark brown. Comments: If you are new to sourdough baking, this bread could be a bit challenging. The semolina flour makes the dough pretty soft and very moist, it could scare a beginner into adding too much flour during handling. The original recipe called for only three cycles of folding, but I added one more. The dough asked for it, it had not developed enough “muscle” at the third folding cycle. I’ve been having trouble with my bread sticking to the banneton in long rises, so this time I took a different path and placed it inside a ceramic bowl heavily coated with rice flour. It worked really well, the bread expanded a bit during the overnight stay in the fridge, and had a nice shape after baking. I left it at room temperature for a little over 2 hours before baking. I wish I knew how to score the bread to get the amazing “flower effect” that Michele obtained, but until I see some type of tutorial for it online, I’ll have to accept a more old-fashioned, rustic type scoring. Take a look at Michele’s full post about it and marvel at his technique… I suspect the blade needs to be almost parallel to the surface of the dough instead of slashing deeply into it. This looks stunning! Your “rustic” approach looks pretty good to me. Thank you! I like rustic, but one day I’d like to be able to make that rose bread…. so beautiful! What a beautiful loaf of bread. If a meal was a performance, that bread would be the star. Another irresistible bread, Sally!!! What a lovely creamy crumb. Congratulations! That is absolutely beautiful Sally! I want a bite of this loaf, it looks amazing! I love making sourdough and I feel like getting bubbles like you’ve got here is always my goal. I’ve been playing around with Michael Pollan’s recipe from his new book “Cooked” with pretty good results but not quite a crumb like yours. I’m curious, have you ever tried the baking in a dutch oven method? I have Pollan’s book but have not read it yet, did not know he had a bread recipe in it, I should take a look. I can imagine the amazing productions you will make with a sourdough starter! Great to be back home, isn’t it? Quelle belle boulle!! 🙂 . I could use a big, chunky piece of this right now with some spicy red pepper jelly and wedge of brie — mmm…. it’s cocktail hour here 😉 and I’m hungry! I wanted to drop in and say how beautiful and appetizing your loaf looks — wish we could enjoy some together with a marg 🙂 . Also gawked your gorgeous blackberry-cherry sorbet — aren’t BB looking great this time of year? Whipped up a little something with them myself this week – couldn’t resist the delightful colour/flavour. Hope you’re keeping well Sally – Have a great weekend! xo. So wonderful to “see” you, hope your new life is going smoothly… exciting times! Have a wonderful Californian weekend! Pois e’, Angela – o pote de ceramica funcionou beleza! 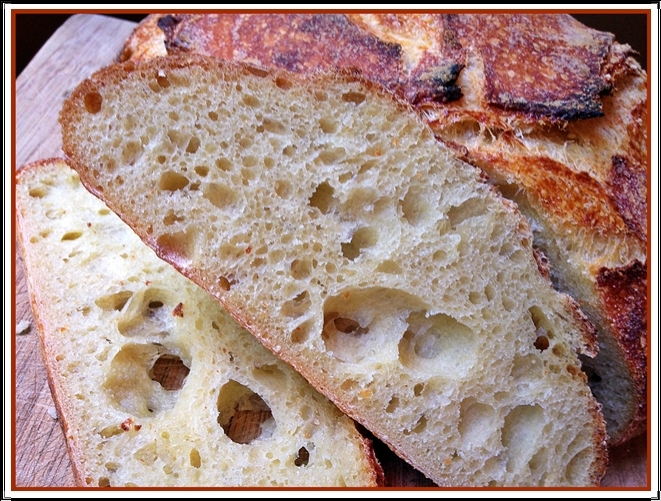 I love that this semolina bread still has those big holes in it! So often it’s much more of a tighter crumb. This looks gorgeous. I would eat the whole thing! I love semolina, so this is right up my alley. Looks amazing. Wow, this is so impressive. 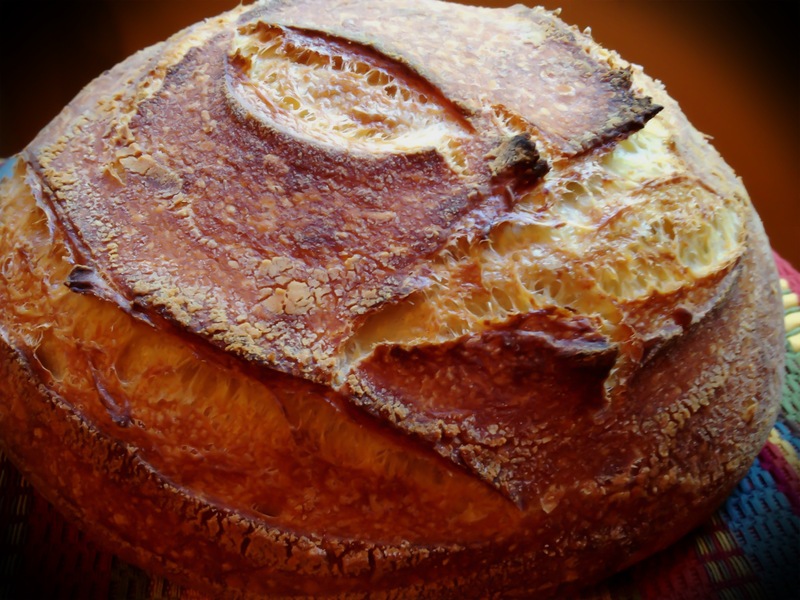 Bakeries in my area are getting up to $6 per loaf for a gorgeous rustic loaf such as this. I love semolina bread. Yours is beautiful. Thank you! Semolina bread is pretty special, and I’m happy that this one had such a nice open crumb – not always the case… and, considering I baked it in an oven that has “issues”, I feel even better about it! Wow. That is one pretty bread! Hi Sally! What a beautiful and rustic loaf! I love the scoring across the surface. This would be perfect with a jar of homemade jam. Thank you for sharing! I’m hosting a giveaway on my blog tomorrow for one of Ryan’s necklaces, and I’d love for you to stop by! I hope you are having a wonderful Sunday! So I then Imade made the with the same amount of flours with 200 g water + 50 g for the salt solution. And I had a wonderful bread. I would love to make this bread. I have the semolina flour but do not have access to diastatic malt. Can I make without this or could I substitute malt extract syrup or malt drink powder? Thanks for any thoughts. I love making semolina (durum flour) bread. Hello, Sondra! I would just leave it out, it should be ok. Hope you enjoy this bread as much as we did! Thanks Sally will give it a go. Have been making RL Beranbaum’s 100% semolina bread which is a little dense, so will try this mix. i must say that semolina flour comes in very different “shapes”, and it’s hard to know how the product you are able to find will behave in this exact formula. Sometimes a little tweaking is needed, so if you feel your dough is way off, add some more flour or water, depending on what happens….